Chris Tomlinson in his favorite chair. Photo by Bob Thompson. Honey bees are not native to North America; they were brought here by European colonists. But unlike the invasive purple loosestrife out in the field, that most environmentalists would prefer to eradicate, the honey bee’s survival is imperative for sufficient agricultural production. When bees began to rapidly disappear a decade or so ago, due to what was generally diagnosed as Colony Collapse Disorder, the only available “cure” was vigilance; and to generate more hives. 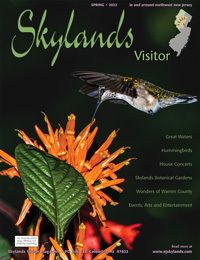 The domesticated honey bee, Apis mellifera, is the most important pollinator of New Jersey fruits and vegetable crops, whether provided by commercial migratory beekeepers or by an expanding corps of suburban apiarists. The Department of Environmental Protection took steps to make sure commercial pollinators were healthy and to facilitate local beekeeping. This year, Life Bee Good has bottled nearly 900 pounds of honey, but Chris is not in it for the money either. “My goal was fifty hives, I don’t need anymore. I like the diversity of locations so if I lose one to a bear or something, I’m not done. Plus I want them to look good, and it’s really all the time I have,” he says, looking out over his hives and describing the personality of each one, as if each colony was the organism, rather than the bees inside. In fact, the genetic composition of each hive is distinct, having come from one queen, the mother of all members in the family. And although honey bees have been selectively bred for thousands of years to produce more honey and sting less, there are differences. “Here is a hive with a feral queen out of a swarm. This hive is nasty, but it produces so much honey it wins out. I know how I have to work it.” Others hives are easier, and Tomlinson would prefer to simply watch, prying only when something is obviously amiss. “The smells are key to me. I bought a stethoscope so I could check in the winter and get my fix.” Chris moves down the line of hives, unprotected from stings except for the smoker he carries. When the smoke hits the bees, they respond by retreating into the hive to eat honey in case this “fire” forces them to evacuate. It also blocks pheromones, body chemicals that are particularly relevant to social behavior. 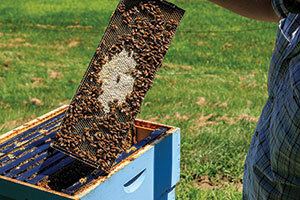 Workers perform a succession of tasks in and out of the hive over the course of their lives. Comb cells capped with beeswax contain finished honey. Photos by Bob Thompson. At the bottom of the hive, worker bees are “fanning” in order to cool and draw humidity through the hive. 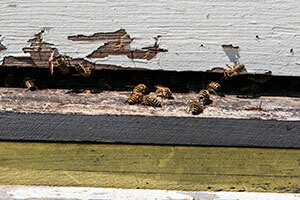 Other bees fly into the hive, some with orange pollen visible on their legs, a sure sign the queen is laying eggs. These are only two of the many tasks that each worker performs in a progression through her short and busy life. Most important is maintenance of the comb, the familiar network of six-sided cells that is the infrastructure of the hive. The workers clean groups of cells in the comb to receive eggs from the queen. A day or so later they become nurses for the larvae. At twelve days old they begin to secrete the wax from which the comb is constructed. As they age, workers seal honey in the comb, feed the drones (males), attend to the queen, pack the pollen brought into the hive into other comb cells, remove dead bees from the hive, and carry water to spread on the backs of fanning bees. The final stage of worker’s life (forty-five days in summer, one hundred or more in winter) is as a forager or scout for new sources of nectar and pollen. There is a stage in each hive when workers decide its time to split the colony, so they generate a new queen by feeding royal jelly to an egg in a chosen, then modified, cell in the comb. When the new queen emerges, the old one “swarms” elsewhere with a portion of the workers to establish a new hive. The third “caste” of bees in a hive, the drones, are there only to mate with the queen. They wait for a virgin queen on mating flight, and if successful, die before they hit the ground. All drones are gone from the hive after honey stops flowing in the fall. Considering such complexity, a beekeeper—a meteorologist, botanist and entomologist all at once—cultivates an appreciation for the natural world. “One of the things about beekeeping and where it’s taken me are the people that I’ve met,” explains Chris. “I was introduced to this group of artists that are completely fascinating, with a different outlook about life and food. They grow their own, and have a whole different mindset. And bees have taught me where my food comes from.” Ask Chris about the medicinal powers of honey, the magic of propolis, or his recipes for making mead, then sit back and listen. Local honey is a treasure. Not only does it taste better than that made by commercial “big box” bees that eat one thing all their lives, but local honey also helps your immune system resist locally-induced allergies. Honeybees came to Jean-Claude Tassot by way of his great uncle, in the French countryside, when he was five years old. The boy helped, watched, and absorbed the subtleties of traditional techniques born from centuries of European beekeeping, until he moved to Paris years later. He grew up, got married, and came to America with his wife, Beatrice, when she got a transfer with Lucent Technologies in 1997. 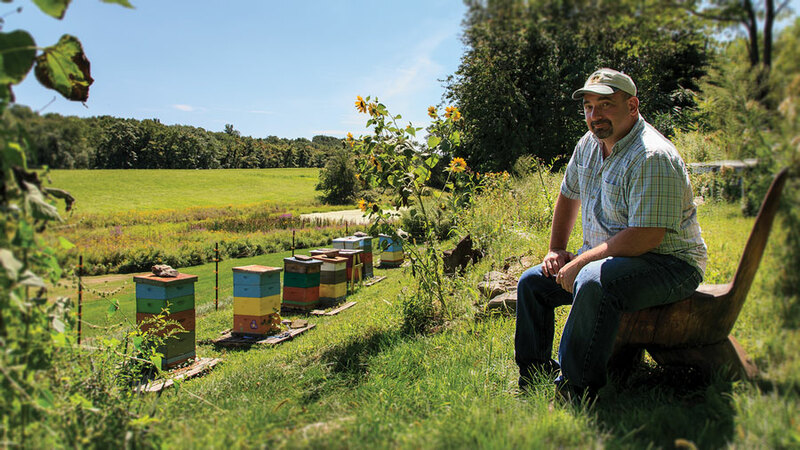 A few years later, Tassot built himself a hive in the backyard so he could teach his son what he knew about bees. The hive produced seventy-five pounds of honey, an amount so encouraging that Jean-Claude began to consider a family venture. More promising was the fact that hundred jars he supplied to a local farmstand sold out in ten days. Tassot Apiaries opened for business in 2002. Above: Jean-Claude at the extractor. 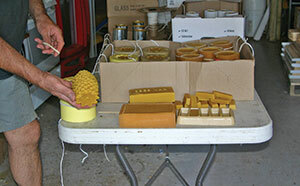 Below: Products from beeswax are handmade at Tassot Apiaries. By the spring of 2013, Tassot tended over two-hundred hives with five different bee species producing ten tons of honey each year. 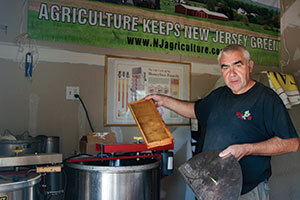 The apiary is a “medium size” enterprise for New Jersey; some keep over a thousand hives. 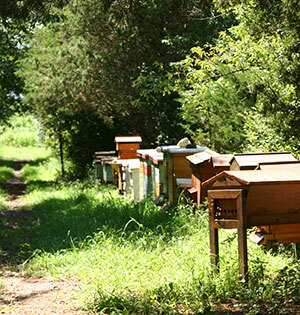 Most of the twenty-or-so locations where his hives reside trade the real estate for pollination services from Tassot bees. There are also hives at the Tassot’s Hunterdon County home in Milford, where they moved from Long Valley so they could have more space. Here, Jean Claude, Beatrice, their son, one helper and an occasional intern produce enough honey and related products to supply over fifty retail outlets year-round. The honey extractor is in the garage, as is the beeswax melter, where one Tassot or another pours wax into candle molds, centering each wick by hand. They also make lip balm, hand and body cream, soaps, furniture polish and blocks of wax for painting. But honey is what most people want. Above: Hives at Tassot's Milford Farm. 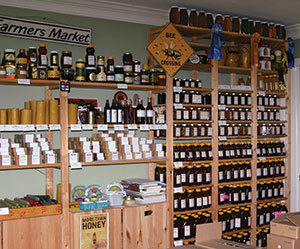 Below: The shelves in Tassot’s shop hold about a week’s worth of honey from their hives. Jean-Claude is a professional farmer. With his family, he makes his living from the honey he takes from his bees. So, while entirely involved with their health and welfare, he must be aggressive. Tassot feeds his bees early in the spring, stimulating the wintered hives to “get moving” sooner than they normally would. By early June, Tassot’s spring honey is ready with plenty of time left to generate another plentiful harvest by early fall. Hives are constructed in sections so that the bees’ essential business—that of the queen and her broods—can be conducted in the bottom two permanent boxes. The frames in the top layers of the hive hold comb filled with honey, transforming from flower nectar by a combination of duties by workers at different stages of their lives. The older foragers drink nectar from flowers, break down the complex sugars, and regurgitate the result back in the hive. Hive bees then ingest the modified nectar, further break down the sugars, then re-regurgitate the inverted nectar into honeycomb cells. Rapidly beating their wings, the hive bees fan the nectar to evaporate any remaining water and thicken the sugars into honey. When the it is ready, the hive bee caps the beeswax cell, sealing the honey into the honeycomb for later consumption. It takes twelve workers to make a teaspoon of honey; thousands to produce some two-hundred pounds in a typical colony each year. Out of that the beekeeper “steals” fifty to sixty percent of a hive’s annual output, leaving enough for the colony to sustain itself through the winter. The apiary produces wild flower honey, of course, but also a dark, sweet honey from buckwheat and another from blueberries. They also churn honey into a spread spiced with cinnamon or Jalapeño peppers. This year the Tassot’s built a barn where they’ll have the room they need to make and store the apiary’s very popular merchandise. Not only will they be able to shop, visitors can watch the various processes involved, from honey extraction to bees wax production. Aspiring beekeepers will be able to purchase kits with which to assemble hives, and Jean-Claude will offer classes. Tassot sighs when asked about the hard times wrought by Colony Collapse Disorder. 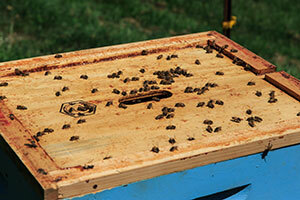 During the winter of 2006-07, the apiary lost seventy percent of its hives. “Bees will not be healthy as long as we use pesticides. They lose their memories, can’t find their way home and are gone forever. But what can I do? We have to keep going.” Jean-Claude is an expert; he knows he has to work as hard as his bees. 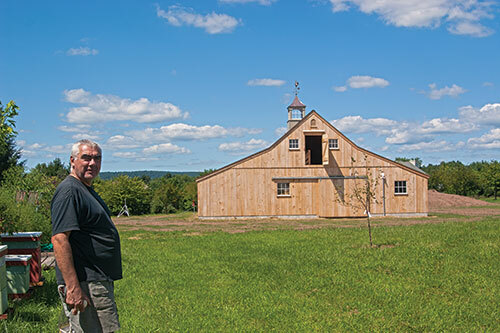 The new barn on the Tassot’s Milford farm will serve as a work area, shop and visitor center.